There are wine clubs and then there are the wine clubs. Wine aficionados who've fallen prey to frequently signing away their dwindling expendable income following the proverbial sip, swirl and tasting sessions at jolly little boutique winery events will be the first to tell you if they've found a subsequent value in stingingly pricey club membership! In order to avoid the cliche clubs in which rapidly overwhelmed and over-extended members end up stockpiling a wine collection they can't actually be bothered to drink (is that possible? Yes, surprisingly so!) a novice or even experienced wine collector is well advised to calculate the risk factor in trusting regular shipments of wine selections to the wine club's experienced sommelier. Enter center stage Sonoma County's sommelier to the stars, this country's first official film festival sommelier and fellow Petaluman, Chris Sawyer. Turns out that Chris and his sommelier business partner, fellow Director and Co-Founder Debra Del Fiorentino have cooked up a sizzling dish of a brand new source for wine clubs, tasting events, online wine and accessory sales. Wine Radius is almost but not quite officially launched, despite a flourishing national waiting list working its way steadily into the thousands. 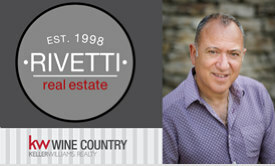 With four distinctive wine clubs under the Wine Radius umbrella, Sawyer and Del Fiorentino have an insider's invaluable knowledge of the inner workings of the next generation superstar winemakers here in California wine country and beyond. "The exclusive, limited edition wines that we are expertly sourcing for Wine Radius are the superstar wine makers' own individual labels," said Chris in the shade of a steamy Saturday afternoon outdoor preview at the new Wine Radius HQ in a tastefully redecorated original Frank Lloyd Wright one story property in downtown Sonoma. "We are extremely fortunate to be working closely with the winemaker's themselves," he said. "And together we've created a super, love, love, love list of incredible wines." With this level of enthusiasm and passion for customized wine and food experiences, wine education, regional and varietal tastings, personalized wine clubs, portfolio management and sommelier assistance, it's hardly surprising that thirsty clients are literally hammering down the electronic hatches to get a glimpse of the Wine Radius lists. Reds, Whites and Beyond features delicious selections of the finest international and domestic wines that Chris and Debra can get their hands on. Every other month members are promised a prime red pick and one tasty selection of white, dry pink, port or dessert-style wine. Young Turks Club offers an intriguing selection of new red and white wines produced by talented winemakers of the future. Wine Radius International offers unique opportunities to taste top-ranked red and white wines from the greatest grape growing regions of the world, on a monthly basis. Whites will include Rieslings, Sauvingnon Blanc, Pinot Grigio, Albarino and top-drawer Champagne and sparkling wines. Reds range from the finest selection of Bordeaux, Burgundy, Barolos, Brunellos, Chianti Classics, Super Tuscans, Rioja, Ribera del Duero, Priorat and Ports. Pinot Kingdom Club provides the best of both worlds, with quarterly deliveries of stunning new releases of Pinot Noir from the West Coast and collectable Red Burgundies from the Old World. Chris and Debra are onto something very cool with their new wine club concept. Much more appealing to the younger and less stuffy wine collectors gathering steam across the states. There are currently only eight states in the U.S. unable to receive shipments of wine club wines, but chances are if you are reading a blog about wine, you'll be located in a prime spot for a nice package of Wine Radius selections to be sent on its way to your front porch! Check out the website for Wine Radius or phone 707 933 1649 for more info on how to inch your way up that list in time for the first shipments!